Welcome to another Becoming a Modern Man! In this article I plan to look at RG Tron, a deck I have wanted to build for a long time. 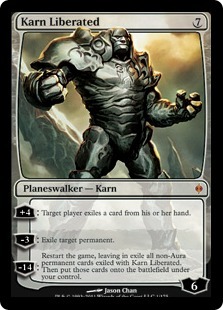 My chance came when Modern Masters 2015 saw the reprint of Karn Liberated, making building the deck far more affordable. I actually started writing this article some time ago too but got caught up in writing about Magic Origins cards and then took a bit of a break from the game. Hopefully the article is still up to date but the thing it won't mention is any of the new Battle for Zendikar cards. I figured I would release this article and then look to try a RG Tron update with BFZ cards as a follow up in the future. Hopefully the article is still up to date as I'm about to head off on holiday for a week so haven't had a chance to proof read it as much as I would like but wanted it to come out before BFZ comes online. It's still a bit of a work in progress and some of the numbers need tweaking but I'm fairly happy with how this list is working. The first thing I would like to change is Karplusan Forest wants to be Grove of the Burnwillows but that card is very expensive so Karplusan Forest is my budget substitute. I also probably want one or two more copies of Oblivion Stone but again expense has kept me away from another. I'm also not sure if the deck wants another Ugin, the Spirit Dragon, it's amazing once you cast it but I'm just not sure where exactly the numbers want to be. 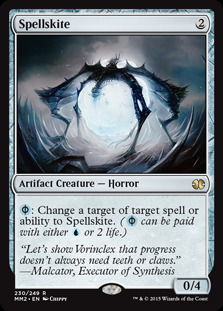 Spellskite is a cheap creature that can help soak up early aggression and redirect burn spells. A useful early road block for a deck that isn't great at establishing an early board presence and needs to get into the later stages of the game. 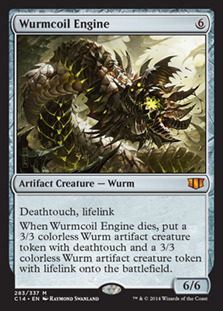 Wurmcoil Engine is an incredibly powerful creature that we can drop as early as Turn 3 in this deck. It is weak to Path to Exile but otherwise it is very resilient - leaving behind two Wurm tokens if it does happen to be removed. The lifelink can put an end to Aggro/Burn decks and the deathtouch means that blocking Wurmcoil is basically always a poor option. 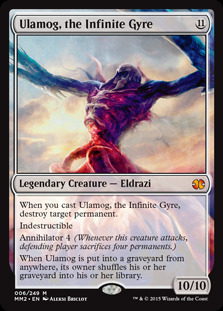 Ulamog isn't quite as game ending as Emrakul (see below) but it is much easier to cast, particularly if you have Eye of Ugin out (which is usually how I tutor it up). It Vindicates a permanent when cast and then poses a serious Indestructible threat thereafter. Unlike Emrakul it is however counterable and can be hit by Path to Exile. However, if it manages to live to your next turn the Annihilator 4 and 10 power will usually finish off your opponent pretty swiftly. 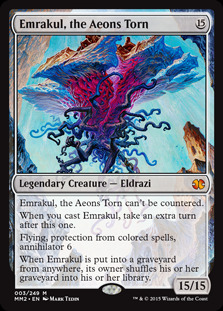 Emrakul is an incredibly powerful creature and has a suitably expensive mana cost to acknowledge that. While other decks look to cheat Emrakul into play this deck actually looks to hardcast it, though granted with ramped Tron mana. Emrakul is the nuclear option for this deck and is usually tutored up with an Eye of Ugin. 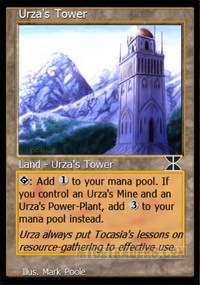 Even with Tron online Emrakul is still not easy to cast, however, you can use your extra land tutors to search up further copies of Urza's Tower to get there. 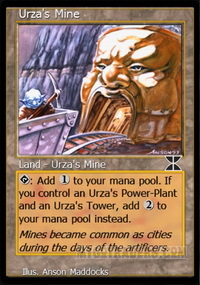 Three Urza's Tower, one Urza's Power Plant, one Urza's Mine and an Eye of Ugin allows you to hardcast Emrakul, and various combinations in between. One of my favourite parts of this deck is playing Karn Liberated. A Turn 3 Karn is a very difficult thing to stop, particularly on the play when you can use it to deprive your opponent of lands. Regardless of when you play it works as a Vindicate or starts destroying your opponent's hand. Karn has a very high loyalty and the fact that its first ability gives it +4 loyalty means it's very hard to remove from the board if you continue ticking it up. Karn is a little more vulnerable if you are forced to exile a permanent immediately, particularly to Lightning Bolt, but it still represent good value if you are able to exile a key permanent. My initial thoughts were that Ugin wouldn't be worth the extra effort for this deck. The fact that you can't cast it until Turn 4, even if you can assemble Tron on Turn 3, does seem like a heavy mark against Ugin. 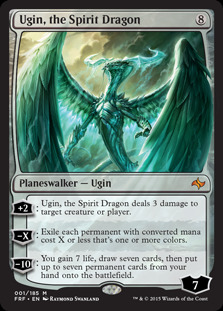 However, if you've ever played with Ugin you'll know just how powerful he is. The -X ability can wipe the opponent's board completely, while leaving your colourless permanents untouched. 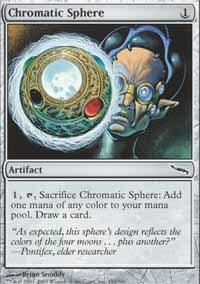 If you happen to be playing against a Control deck of one that isn't big on coloured permanents then the Lightning Bolt of Ghostfire that is the +2 can go to the dome or deal with any artifact creatures. After only a couple of turns of using the +2 you will then be in a position to use Ugin's ultimate, which is awesome and doesn't even kill Ugin in the process (if untouched he will be at 11 loyalty leaving him on the board with 1 loyalty remaining). Drawing 7 cards, gaining 7 life and dropping as many as seven permanents onto the board, which will often include some combination of Tron lands, Karn Liberated, Wurmcoil Engines and Eldrazi, tends to be game ending. 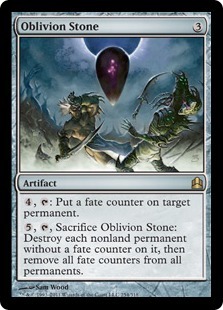 Oblivion Stone is a tremendous removal spell, capable of wiping the board of all non-land permanents including Planeswalkers, artifacts and enchantments. If you have the time you can also choose to save your own permanents by dropping a fate counter on them. Clearing the board leaving only your Karn Liberated behind is a great way to control the game. Oblivion Stone's price spiked somewhat after Modern Masters 2015's release thanks to the greater availability of Karn Liberateds, however, that bubble has burst a little since then. That said O-Stone is still a very expensive card - as such I'm currently only running two but I believe 3 or 4 is the correct number. Early pressure can be a problem for Tron decks, as the deck doesn't always get off to the fastest of starts. 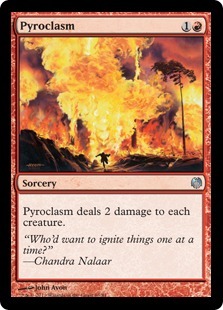 Pyroclasm provides an answer to this early pressure as a card that is capable of dealing with a number of early threats, allowing you to press on into the long game. Stirrings isn't solely a land tutor but early on you will probably want to use it to grab a Tron piece out of your top 5 cards. 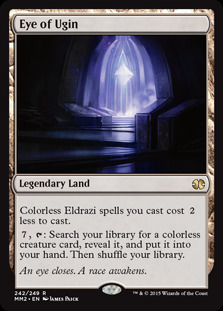 Stirrings actually allows you to pick any colourless spell so you can pick up one of your cantrip artifacts, a Wurmcoil Engine or even an Eldrazi depending on what you are looking for. Sylvan Scrying and Expedition Map are our specific land tutors. Being able to search the exact land you need is very important for Tron and so Sylvan Scrying and Map provide us with a very powerful tool when putting Tron together. Once you have Tron you can search up additional pieces to further boost your mana or Eye of Ugin to ensure you can keep getting access to threats. 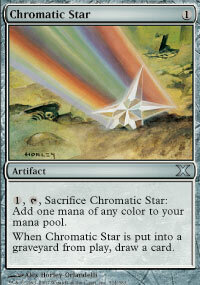 One of the big problems with playing Tron is that it limits your access to coloured mana. The answer to that problem lies in these little baubles. 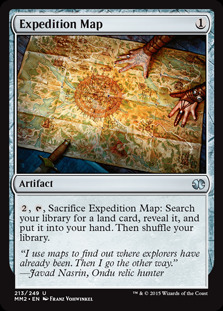 These cheap artifacts allow you to generate a quick fix of coloured mana while also drawing deeper into your deck to find the pieces you need. Another cheap artifact cantrip with additional utility. Emptying graveyards can be very useful against Snapcaster Mage and can make casting a Tasigur, the Golden Fang much more difficult. It also incidentally hits a lot of other decks and strategies that rely on decks not having main deck graveyard hate - such as the Goryo's Vengeance decks. 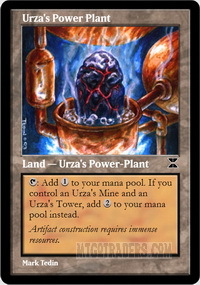 The Urza Lands, or Tron as they are known, are a very powerful way to generate colourless mana. Once combined they can produce a total of 7 mana and much more if you further Tron pieces to the mix. 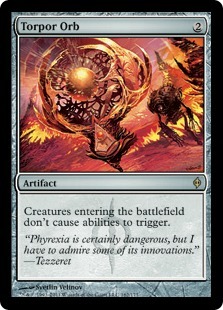 RG Tron sometimes suffers from situations where you are able to get the right lands together but then are unable to find your big threats to cast. 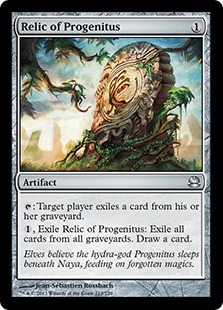 Eye of Ugin goes a long way to helping resolve that issue as a tutorable land that can then search up your threats. It also reduces the cost of Eldrazi spells, allowing you to cast Ulamog for 9 mana and Emrakul for 13 mana which does work out as a significant discount. 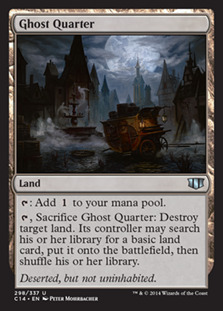 Ghost Quarter is extremely useful in the mirror match and can also destroy opposing land hate, such as Tectonic Edge and opposing Ghost Quarters. 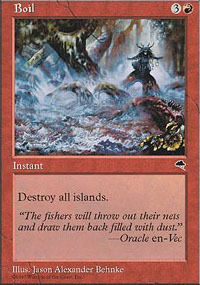 It also has general utility against manlands or can cause mana problems for greedy manabases. Boil can be a devastating hate card against Blue decks. If you can stick it it will often spell game over for Blue Control decks. 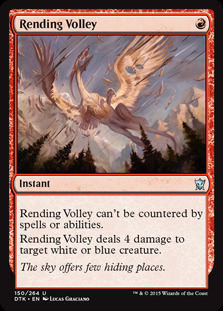 Rending Volley is an answer to Splinter Twin's combo pieces as well as other dangerous blue and white creatures in the format. Even killing an early Delver of Secrets is worthwhile. Platinum Angel is another big colourless spell and can be very difficult for some decks to deal with. 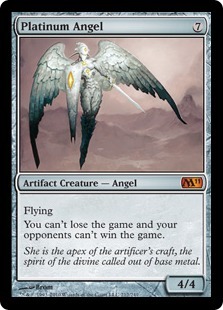 In such situations sticking a Platinum Angel can just spell game over for your opponent. At the very least it can buy you more time to start dropping Eldrazi. Thragtusk is a strong drop against the aggro decks of the format with the 5 life being a huge boost. I'm not sure if it isn't a bit too slow for purpose though. Feed the Clan could be a cheaper substitute for the life gain but not sure that really solves the problem. Nature's Claim is good in the mirror match and against Affinity amongst other decks. In theory you can also use these as a source of life gain, destroying your own artifacts but not sure if that's necessarily a winning strategy. 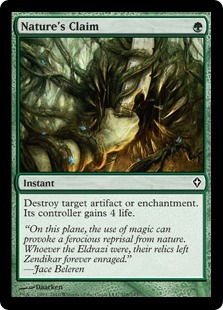 Nature's Claim can also help blow up problem sideboard cards our opponent's might have like Stony Silence and Blood Moon. 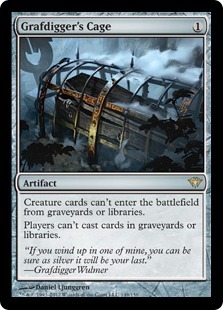 Grafdigger's Cage and Torpor Orb are effective hate cards against various strategies and fill out the sideboard. See the main deck for the explanation behind Ghost Quarter and Spellskite. Extra copies come in for where these cards are particularly strong. Our first match is a RG Tron mirror. The mirror is an interesting matchup as you race to put Tron together and hit your haymakers. Some games are just a question of who can stick Karn Liberated first as exiling their Tron lands is very powerful, particularly as they will struggle to pressure Karn himself. Other times it's all about going big, which are the more fun games. Our second matchup is against RDW, which is undoubtedly one of the worst matchups for the deck. Their speed is very difficult to handle, particularly as the deck does have much in the way of early board presence. Your best shot at winning this match is sticking an early Wurmcoil Engine but with cards like Atarka's Command and Skullcrack that's still no guarantee of a win. Spellskite can help out of the board as an early blocker and potential way of redirecting burn but this remains an unfavourable matchup in general. Our third and final matchup is against Grixis Delver. This may not be the most representative version of this matchup as my opponent stalled quite a bit but in general I think this is pretty good matchup. The deck doesn't always get the cards to apply early pressure which gives us the time to set up our end game, which is just too powerful for their deck to handle. In general I think this is a favourable match for us - it is possible for them to tempo us out but when we are generating huge mana cards like Mana Leak and Remand aren't nearly as effective. I have had a lot of fun playing this deck, even if I haven't put together a properly finalised list. RG Tron specialises in going over the top of its opponents and it does that in some of the coolest ways possible. Dropping large colourless Planeswalkers, Wurmcoil Engines and Eldrazi is great fun and when things are going well the deck just feels unstoppable. One of the strongest things I can say about this deck in the current metagame is that in my experience it has a very good matchup against Grixis Control. Grixis decks seem to be increasingly popular and Tron is well set up to beat the deck by going over the top if it cannot mount early pressure. Aggro decks remain a problem though, particularly Red Deck Wins which has caused me some major headaches. Beating Burn is very difficult for the deck and I'm not sure what more can be done to shore that match up. Another weakness of the deck is that it can have some awkward draws. Sometimes you put together Tron early but just can't find the threats to back up the mana. Equally, the opposite situation can occur where you draw your big threats when what you really need is a tutor for that final Tron piece. However, I think for the most part the deck is well tuned to try and avoid these situations. Overall RG Tron remains a very strong deck in the format, however, I would recommend avoiding it if you are expecting a Burn/Aggro heavy metagame.